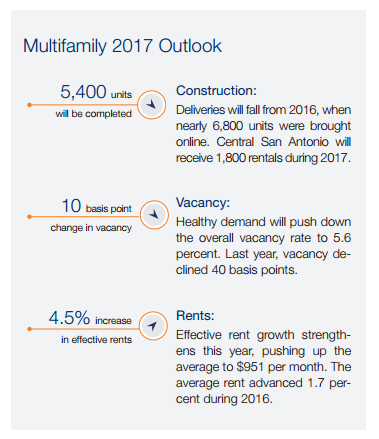 ​SAN ANTONIO – A new Marcus & Millichap report for 2nd quarter of 2017, said the vacancy in Class C apartments fell to 5.5 percent while Class A apartments, has gone up to nine percent. The average rent price in the city rose 1.7 percent over the last 12 months to $951 and is predicted to continue to increase by as much as 4.5 percent. The Alamo Heights area continues to have the highest average rent in the metro at $1,238 a month. Sales of multifamily units also saw growth during the last year, surging 27 percent with the average sale price rising to $81,600 in 4Q 2016. The northern portion of the metro continues to be the most popular purchase area for multifamily units, with nearly 65 percent of all apartment sales occurring in 2016. Central San Antonio is also a hot market with more than 1,800 units under construction right now. Renters make up 42 percent of San Antonio's total population according to the Marcus & Millichap 2Q 2017 report.